Jay and I are relatively new on our block. We just achieved one year of moving into our home on Mifflin Street. I'm pleased that within the year we have gotten to know some of our neighbors well enough to borrow a cup of sugar (literally), and others who we wave at as they drive by (and they wave back) or who stop as they are walking their dog for a bit of small talk. These casual friendships are wonderful, and I would like to deepen our friendships and relationships with a few people on the block. This reminds me of a story my dad once told me. Early on when we were on our farm, he met some people who were even newer to the area than my family. This fellow asked my dad, "How do you get to know your neighbors?" My dad replied, "Your borrow something and return it better than when you got it." They then parted company. The next day, that same fellow came up the hill and asked to borrow a tool from my dad - and that family has been life-long friends since. I love that story - it says so much about neighborliness, and taking risks to ask for what we need, and taking risks to trust people. 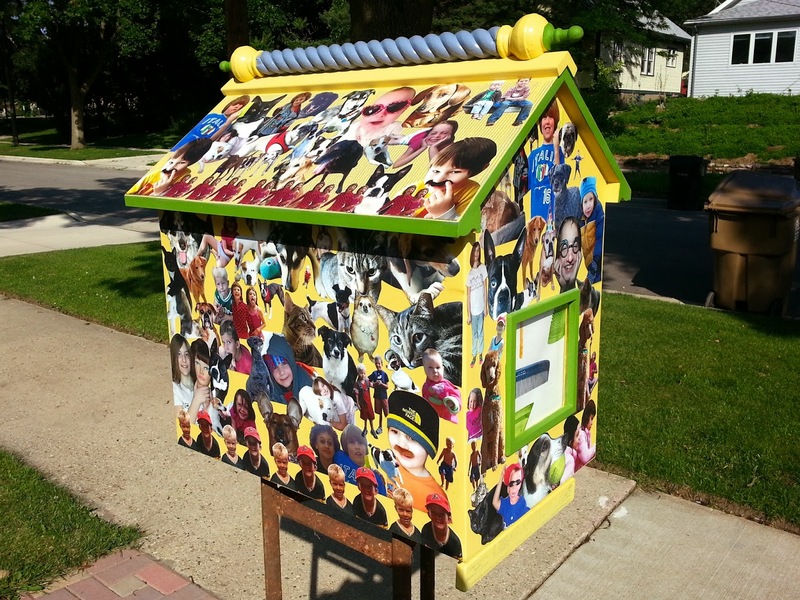 A great example of building community is the growing "Little Free Library" movement. Here is one across the street from our hours that the creator and owner incorporated photos of children and pets from our block. So with that favorite story in mind and after discussing it with Jay, one afternoon last autumn I crossed the driveway to our next-door neighbor's house, knocked on the door and said "Hi there, have you two ever thought of raising chickens?" No sooner had the word "chickens" left my mouth when Matt called to his wife in the house and said, "Come here, you're going to want to listen to this." It turns out they were interested in raising chickens, but were concerned that their two dogs wouldn't get along with them. My proposal was to build a coop together on our land (away from their dogs but really close to their house) and co-parent a small flock together. They were in. This winter we are going to plan our coop, work out the co-parenting details and figure out how to do this together. This is exactly the kind of thing I want to do with my neighbors, and it feels very much like building community up around me. It's also good to remind myself that community building happens in small increments, and before we know it, we've got something we can all love and appreciate.